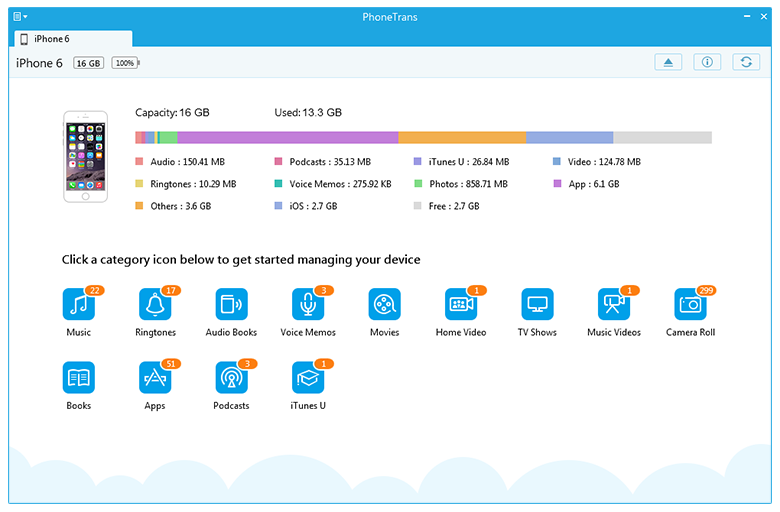 PhoneTrans is one of the best free iPhone music transfer software for all iOS users, and you can choose this freeware to selectively transfer your media files, like music, movies, videos, voice memos, apps, etc, to/from your PC & Mac, without iTunes limitations. Its interface caters to the style of Win 8 and Mac 10.10, so that you can quickly and easily handle this freeware. With PhoneTrans, you can also add or delete your desired media files. 1. Import media selectively from any PC & Mac without erasing existing files. 2. Export all media files from your iPhone/iPad/iTouch to PC & Mac as a backup. 3. Make any videos and movies fit every iPhone/iPad/iPod touch automatically. 4. Refresh, browse, add and delete the media files on your device. 5. Multiply uninstall apps on your device in 1-click, and install an app in a minute. From the main interface, you can take an overview for all your media files. Simple click the corresponding item you want to start transferring files for free.